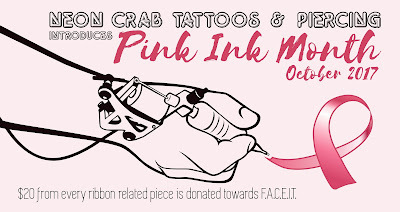 Our annual Pink Ink event is coming, and this year, it will last all month long!! During past events, we offered set designs at set prices. However, since our Pink Ink event was packed into one day, we were hard pressed to help create the customized pieces you truly wanted to represent the strength and courage of yourself or loved ones, due to time restrictions. So this year we have not only extended the event for the whole month of October but we are happily accepting custom creations!! Our standard shop minimum and hourly rates will still apply; however $20 from every ribbon related piece will be collected throughout the month and donated to the F.A.C.E.I.T. program just like the years prior. Come on in to your local Neon Crab and have a consultation for your custom pink ribbon today! *Past flash ribbons will still be available for $80+taxes each. Ribbon colours may vary but proceeds all go towards F.A.C.E.I.T. So give us a call or stop on by to book your pink ribbon tattoo. Show support, raise funds, and get involved! !